On the way to preschool a few weeks ago my son and I got to talking about foreign species of animals and how destructive they are to the habitats they invade. 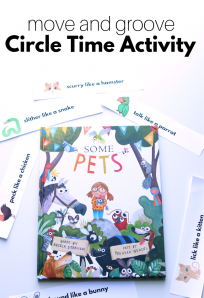 In that rather complex conversation, I realized my son knew a lot about habitats but there were some animals he simply said came from the zoo … it was time for some learning cloaked as a game. 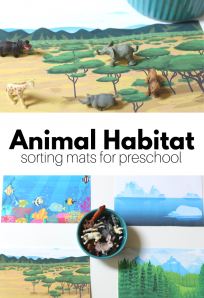 I finally got around to making this habitat sorting game over the weekend and we had fun. Gather your materials. I used construction paper and scissors for the paper habitat mats I made, double stick tape and a glue stick. 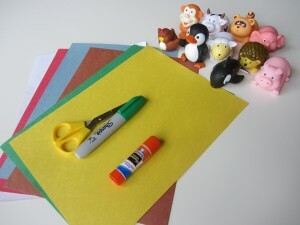 You will also need a marker and lots of animal toys. Some of ours are bath toys that weren’t all the way dry… oops. 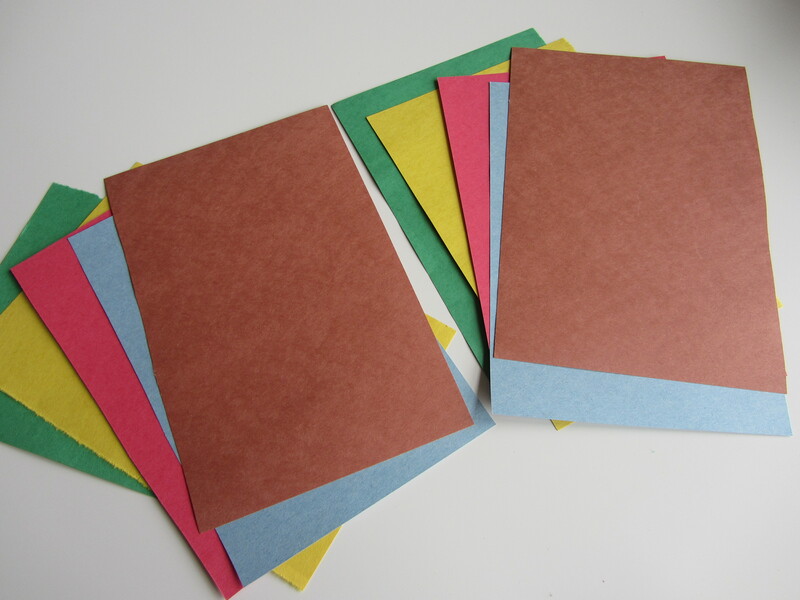 Start by cutting the sheets of construction paper in half, this size is perfect for the mats and then you can use the other half for the cut outs. Decide which habitats you will make. 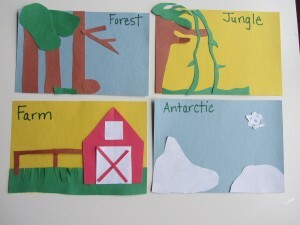 I decided on jungle, farm, antarctic, and forest because of the animals we had on hand. Remember to use the toys you have for learning, with some brainstorming you can save money and play with all those extras that don’t get much use. 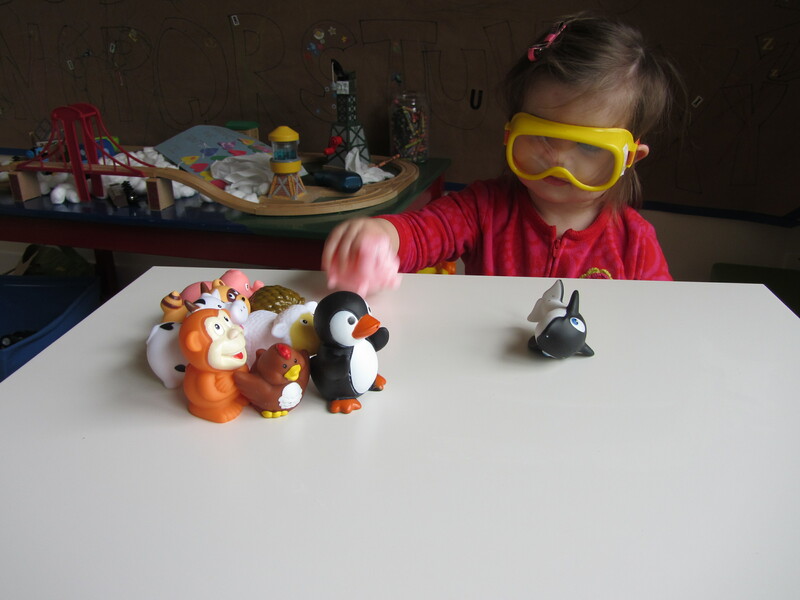 My helper played with the animals while I brainstormed, with her goggles on of course. Create. I loved doing this. If you have older kids see if they want to create this for their younger sibling(s). Label them and call for someone to come play! With my five year old I let him sort and when he tried to put the raccoon in the jungle I asked “Have you seen raccoons around here? Do we live in the jungle?” and let him answer and adjust. Always ask why because sometimes they have a darn good reason that may only make sense to them but it will likely open up a teaching opportunity for you. Younger kids like my daughter can do a simplified version with only one mat and a simple yes or no sorting activity. I’d focus mostly on labeling the animals and their attributes at that age. After he sorted the rest I took some and placed them in the wrong place. Asking why a monkey couldn’t live in the antarctic, or why a whale wouldn’t enjoy swimming in the pond in a forest. This forced him to consider why animals live in specific places. 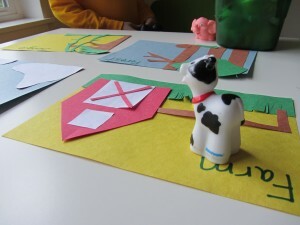 We also touched on domestication and how farms and zoos are different. It was the best part of the lesson and wouldn’t have happened without the sorting game as an ice breaker. These are my ideas for extending the activity for children who are ready for it. The next step for this would be to purposefully put an animal in the wrong habitat. Then ask your child to write down a list of things they would need to survive in the wrong habitat. For example, a monkey in the antarctic would need warm clothing, fresh fruit delivered, an enclosure built off the ice, maybe even some snow boots! Let them make the list but make sure they answer why they need each item too! 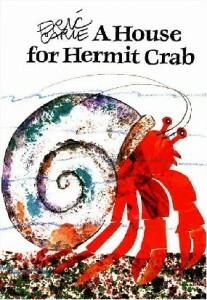 A House for Hermit Crab is a book I have owned for many years. It offers so many learning opportunities for young readers and doesn”™t lose any of the entertainment in trying too hard to teach. The hermit crab feels drab and each month he asks different sea creatures to help decorate his shell. As the shell is getting more and more beautiful it”™s also getting more and more snug. This shows a sign that it’s almost time for the hermit crab to leave it behind and find a bigger one. 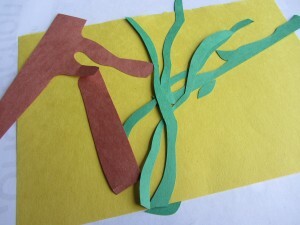 The book teaches about sea creatures habitats, months of the year and moving. More than moving it teaches about change . Change is difficult for all of us but a little trickier for most preschoolers which make this book so valuable. For more fun preschool and kindergarten aged activities, make sure to follow me on Facebook! For more quick tips on helping your child learn to read check out my book; Raising A Rock-Star Reader. It is packed with fun ideas for families, book lists, and advice for parents. I thought the best part of this post was your little one wearing her goggles!!! So super cute!! great idea to start learning different environments. Already post to pinterest. Thanks for the great ideas. Great idea! I have so many little animals in the kids toys around the house and the fun part is that both of my kids, 3 1/2 and 1 1/2, will enjoy it! JDaniel is asking about animal groups a lot lately. This would be a great activity to do with him. This is so stinking cute! I cannot wait to try this. That picture of your daughter is hilarious! Love the concept, love the execution! Well done! I love this idea so much! 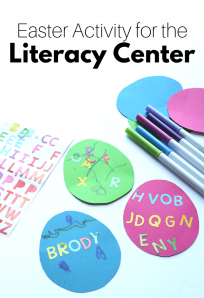 What a great, fun learning idea! Can you tell me where you got those adorable little animals you used? I would love to find some like that. Just discovered your blog through pinterest and will be referring back to it many times I know. Thanks for sharing all these wonderful posts! I’m always looking for fun activities to help my children learn without them actually feeling like they’re learning! Great idea! Will have to try this with our youngest! We have about a million (okay, maybe closer to 100 or so, but still…) of those little animals that come in the tubes. Anyway, it was getting to the point where there were too many to play with at once and a pain to figure out what ones we wanted, so I took my sons to the fabric store where we picked up a fabric that matched each animal habitat (jungle, deciduous forest, ocean, Arctic, etc). When we got home, I made some quick drawstring bags. 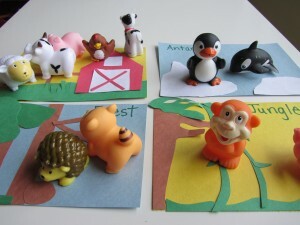 Now, the boys can find what they want and pick-up time is a sorting activity by animal habitat. I just wrote a post about searching for animal homes outside to go along with another Eric Carle book – My Very First Book of Animal Homes. Your activity would go perfectly with that book as well. I’m adding it to my Animal Homes board on Pinterest.